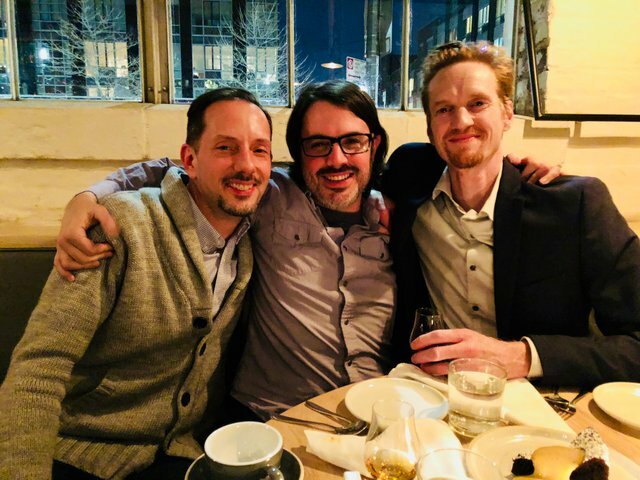 It’s been a very exciting few weeks for the HardFork team. With Eric in New York City for the last two weeks we’ve spent some amazingly productive creative time working on the series. The development is coming along beautifully as we enrich the project in manifold directions. 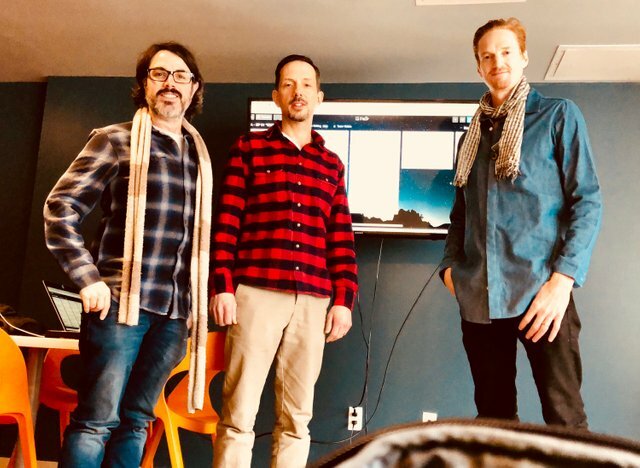 Doug, Eric, and Chris in front of the storyboard during an intense HardFork writing session. HardFork Entertainment, Inc. is officially a corporation now, with a working corporate bank account, so we can begin to finance and actively manage growth of the HardFork Universe with current and future sponsorship funds. In the last week we’ve had a pair of fantastic sessions with our team’s Distributed Ledger Technology expert, Matt Neimerg, covering all of the science and mathematics that underpin the story elements and tech we’re infusing into the series. Matt has been very gracious and patient to take the time to explain (and sometimes explain again more slowly and in simpler terms) the intricacies of how the tech works so we can portray it as accurately as possible in the series. These sessions with Matt have been proven to be educational, fruitful, and a lot of fun. 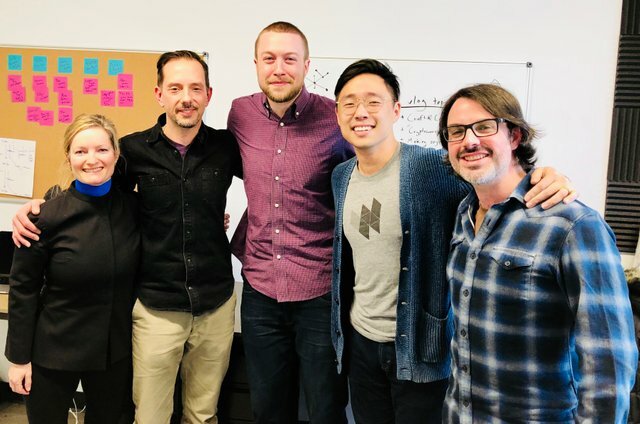 Doug and Eric were invited to a meetup at the @sndbox headquarters in the Bushwick neighborhood of Brooklyn for an enlightening conversation on current a future @sndbox initiatives. Not only are @voronoi and @hansikhouse great guys but they are a tremendous asset to the Steemit community. Pictured are @natureofbeing, @ericvancewalton, @voronoi, @hansikhouse, @dougkarr. 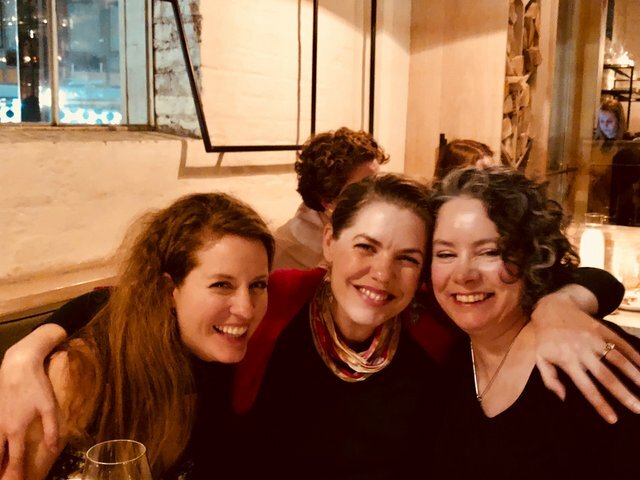 All the while Naomi Brockwell has been traveling conferences around the world from Australia, The Cayman Islands, New York, Acapulco, and at upcoming d10e conference in Silicon Valley raising awareness about the HardFork Series project. Eric, Chris, Doug and their lovely wives took a break to enjoy a celebratory dinner at the lowest point of last week’s crypto market dip. Luckily, the market started to recover by the time our hangovers eased up the next day. Eric, Doug, Chris, and their wives. Lastly, we spoke with HardFork advisor, Matt McKibbin, yesterday about some exciting crypto-conference speaking engagement opportunities for the HardFork team in March and April. More news to come! We thank you for your continued support and will continue to provide regular updates on our progress. @HardFork-Series is an upcoming narrative film mini-series with a decentralized filmmaking approach to be produced in New York City and around the world, the team includes writer @ericvancewalton, writer/director @dougkarr, star and writer @bakerchristopher, producer @skycorridors, technical lead @complexring, executive producer @andrarchy, growth hacker @nickytothenines, the amazing HardFork-Universe crew, and the entire Steemit community. Please reach out to any and all of us to get involved, or simply reply below and we'll reach out! 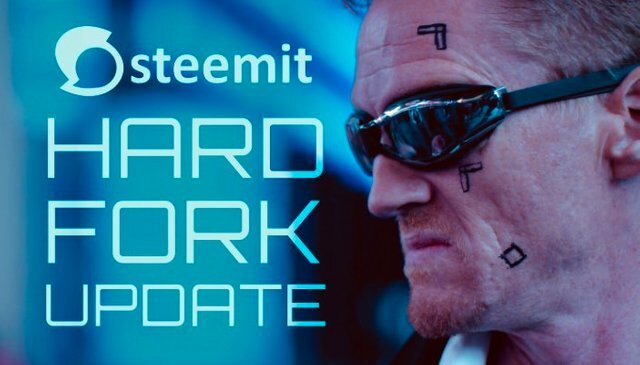 We'd also love it if people posted about their ideas on Steemit using the #hardforkseries tag, we just want to point out that in order to avoid any liability that we will be assuming everything posted within that tag is intended to be a derivative work of the HardFork series and so the HardFork team cannot be liable for any apparent similarities between the content and the final product. Looking forward for new hardfork material!! HardFork Entertainment Inc. thats sound very good. Eric, Doug, Chris best wishes for your future projects. Well, After a long time, you come, it's not a fair thing with Hard fork followers. But Congratulation on the new and amazing face of #HardFork series and spent time on amazing and creative time working on the series. now it worth for us. I think your hard work will make this series become unstoppable, due to adopting new mechanisms and team support, I wish you best of luck for your new initiatives, all of this meet up looking full of excitement and joyful, and faces expressions tells more than words that there should be something happened which gonna be really mean for the community. Now, am excited about your upcoming new mini-series, that will become the for new dynamism for your huge followers. Awesome to see the progress continue and just as importantly to see how much fun you guys are having with decentralized living! Freedom is awesome and creativity flourishes best in freedom! Hope to talk again soon. Great to hear you are getting lots of technical support - it is going to be an awesome script! Hello @hardfork-series! Your post was nominated for an upvote by a member of the sndbox incubator. It was great hanging out with @dougkarr and @ericvancewalton this past week, learning more about this incredible series. Steem on! well thanks for sharing this with us ..
Its nice stuff and fiction. I appreciate the best of this event that you have done so well for this team and it is a great opportunity for your people to take the team forward. Good work. And good luck. Thanks for this for this wonderful information. Kudos to HardFork team! I'm looking forward to seeing films from this great team!! these are wonderful updates you shared @hardfork-series..
i like with this .. the picture is bright .. clear and clean . I'm glad you chose to do this in a information, I look forward to listening while a work during the day. followed. I espicially congratulations your activity.Carry on.I appriciate your activity so much. Rock on, I missed this update, 2018 is the year it all comes together! awesome stuff guys, best regards!